The 2019 Synergy Vision Graduate Development Programme began this week with five recent graduates keen to embark on a career in medical writing or accounts management. As Editorial Director at SV, I’ll be one of the folks welcoming the new recruits. It’s one of those moments that begs for a bit of reflection after 12 years in the industry. I wondered what I would tell a wee young Sarah Nelson if she were beginning her career in a med comms agency now – besides that she’d found the right path. Firstly, the nature of the work means we are subject to client demands, and these will come in peaks and troughs throughout the year. So there will be busy times. And then there will be REALLY busy times, when everyone just pitches in and does their best. Suffice to say that senior staff will be trying their best to manage these periods and limit the impact on the junior team, but these periods are unavoidable and happen in agencies across every industry. Some (weird) people (like me) actually work at their best during these busiest of times. Agency newcomers will soon find out if this way of working is for them. Part of getting a handle on this is good time management. And part of this is making sure you know the basics of working in an office before even beginning to handle the intricacies of your industry. It’s important to know how to respond to emails in a professional and timely manner (u need 2 stop using social-media speak at work). And keeping on top of emails is a useful tool. Another one is keeping track of your time, since each piece of work is likely billed to a different client, and you’ll be asked at some point to record the time you spend accordingly. Which leads to my next point. 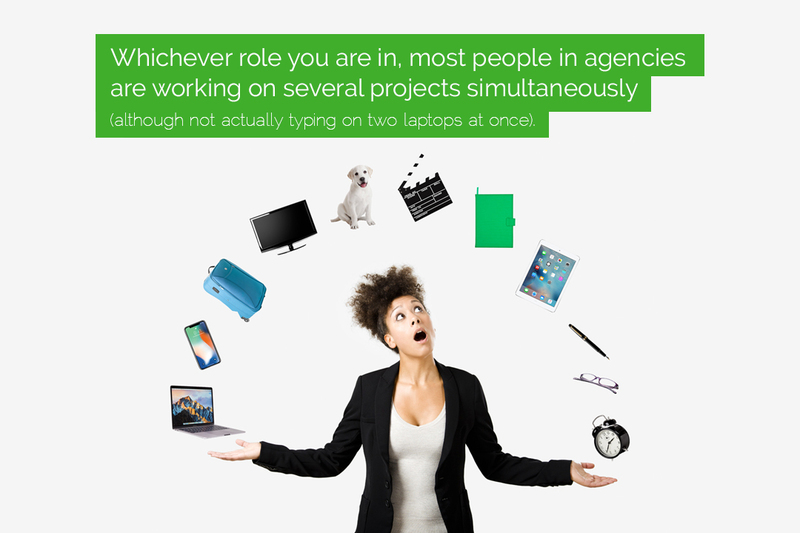 Whichever role you are in, expect to multitask like you have never multitasked before. Most people in agencies are working on several projects simultaneously (not actually typing on two laptops at once). This means juggling deadlines and different project requests. When you’re new, it will also mean responding to and actioning feedback on each piece of work. Finding a way to keep on top of this is also key to long-term success. Finally, some positives – and they are indeed there for the taking. Compared to, say, a corporate environment, you are more likely to feel that your work is recognized and has an impact in an agency. You may be lucky enough to be part of the agency’s growth and in winning new work. Variety is key – few people in agencies will be doing the same thing every day and we enjoy the challenge this brings. Writing a digital piece about osteoporosis in the morning, followed by a haemato-oncology meeting report in the afternoon? Love it. That’s an interesting day’s work for me. So, welcome to agency life. You’ll either love it or you’ll hate it. But you won’t be bored.